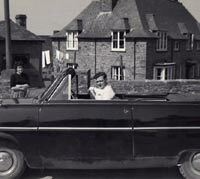 Ford Consul Mk1 Convertible & Saloon cars. Homepage. 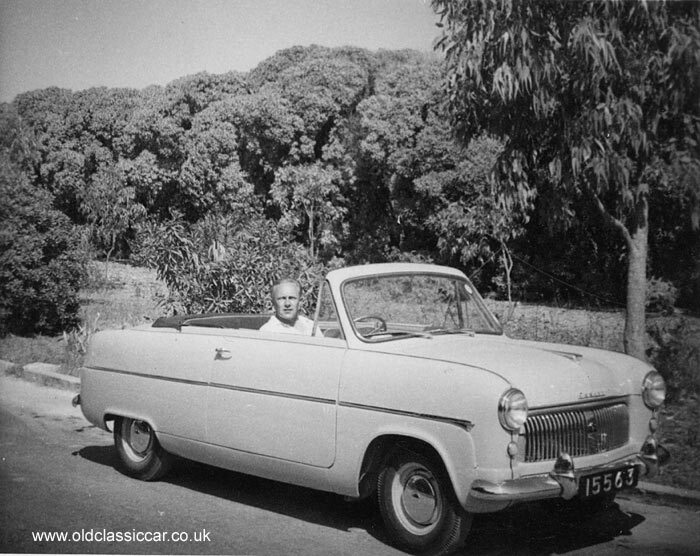 This page: Mk1 Consul convertibles in Gibraltar & Utrechy, plus Consul saloons seen elsewhere. Firstly, another period photograph from David, the rocking horse restoration guru (see Rocking Horse Sales & Restoration), this time showing a very rare Mk1 Consul soft-top. 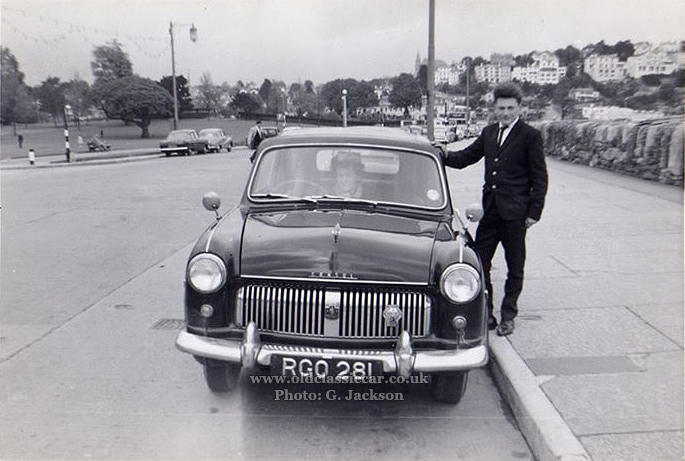 This particular car was photographed in Gibraltar, some time in the 1950s. 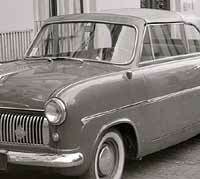 I am sure that very few of these Consuls were built, I wonder how many convertible variants survive now?? the climate in Gibraltar is probably kinder to old British metal than back home, so perhaps this Ford, registered as 15563, still lurks in a dusty barn awaiting a saviour? Another overseas example of the rarely-seen Consul convertible may be found further down this page. 2. A two-tone Ford Consul built in 1954. 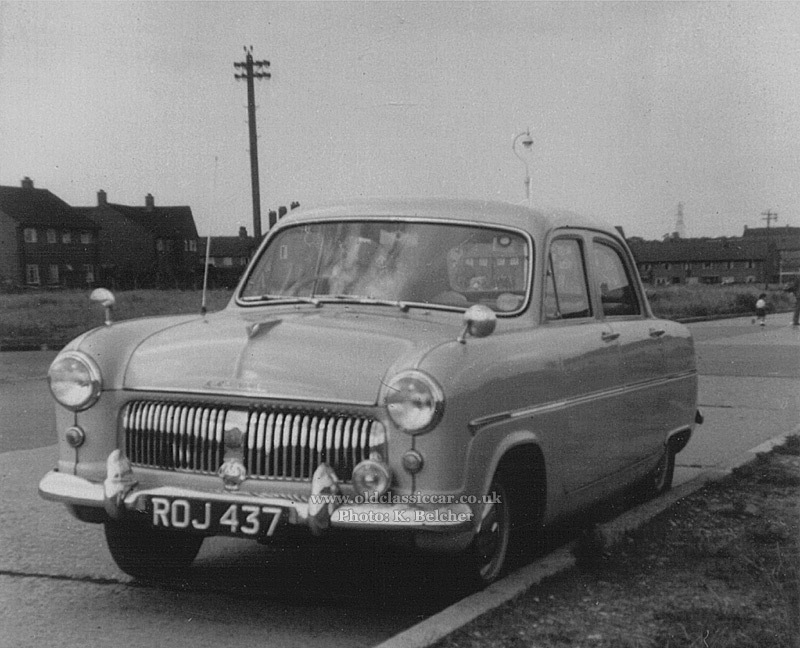 Second photograph on this Consul page, was kindly sent over by JohnDale McAllister, and shows a two-tone '54 Mk1 Consul parked at the kerbside. Registration number was HST 342, and this one had been upgraded with extra lamps, a matching pair of wing mirrors, and a 'leaper' on the bonnet - is that a Jaguar mascot? 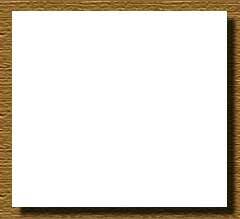 A leaflet describing the colour options for this range of cars may now be found here. 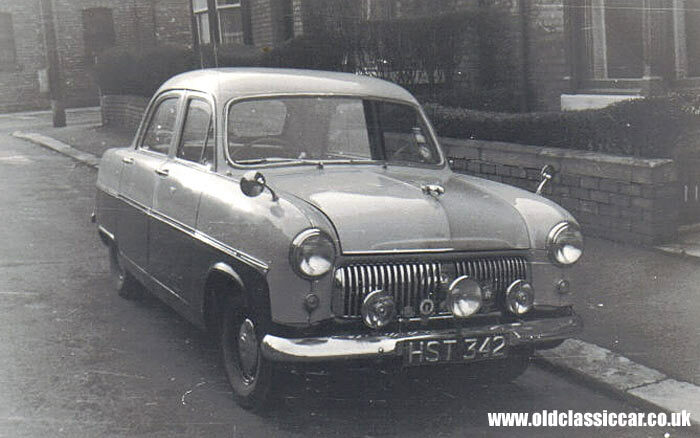 Dating to 1953, an original press photograph of a Mk1 Consul as issued by Ford's marketing department. 4. Consul in a street scene. The location of this shot isn't given, but could easily have been taken in any high street in the UK during the early 1960s. Various (now) classics are in evidence, including a light-coloured Mk1 Consul. Behind the Consul, and parked outside C.C. Cartwright's emporium, is a VW Beetle, while behind that is a butcher's bicycle. Nudging into view on the lefthandside, outside an off-licence, is a Ford 307E van or estate, based on the 105E Anglia. Giveaway that this isn't a 105E saloon is the profile of the door's lower edge, rising to the rear so as to avoid crunching high kerbs while a delivery driver does his or her rounds. Examples of Vauxhall and Austin are parked further away, while on the other side of the road, a chap is busy trying to load a sheet of ply into the back of his, or his customer's, Austin A55/A60 Countryman. A bicycle, probably unlocked, leans against the nearby lamppost. 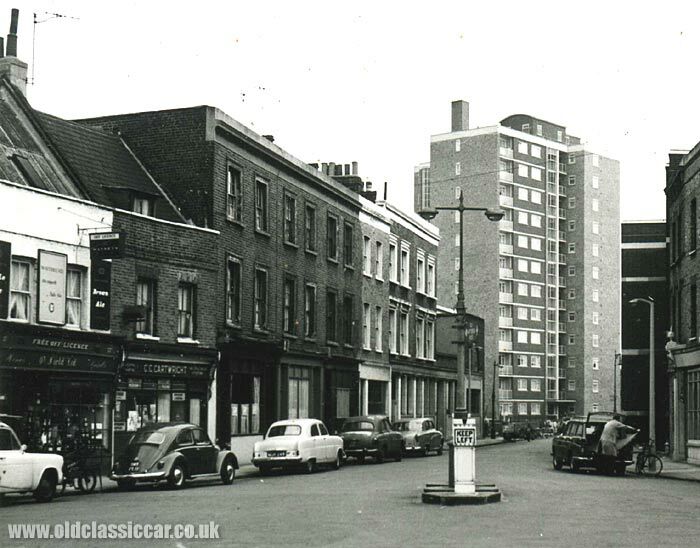 Note the high-rise block of flats in the distance, all the rage in the '50s and '60s but not so revered now. Does anyone recognise the location? and if so, do the flats and shops survive? 5. 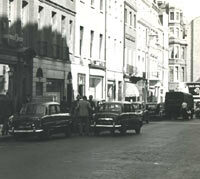 Mk1 Consul and Zephyr Six in London. 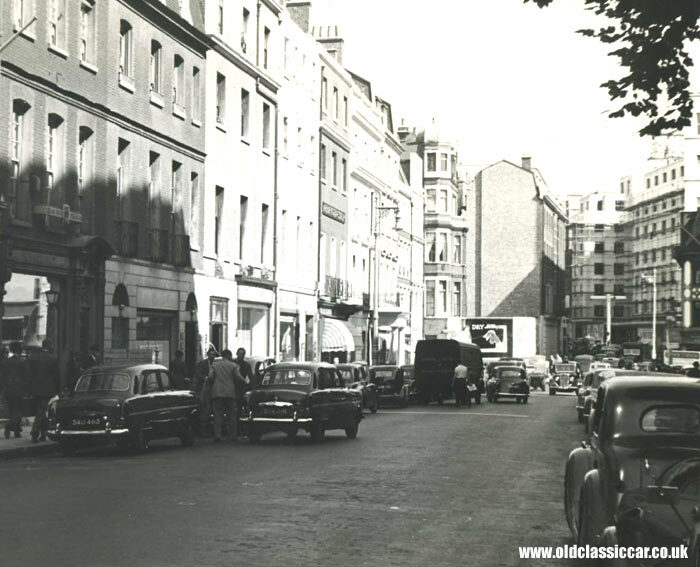 This next street scene was captured on film on the afternoon of September 7th 1954, as part of a survey looking at congestion and parking issues in London. Alas there are no notes advising the location of this particular image. To the left is a Mk1 Consul (SAU 465) parked at the kerb, while a similar-looking Mk1 Zephyr Six (STV 241) is unloading its passengers. Further up the street, causing something of an obstruction, is an Austin K8 van being passed by a Minx. A number of other post- and pre-war cars are in evidence, including an unidentified pre-war tourer of some description to the right of shot, close to the photographer. 6. 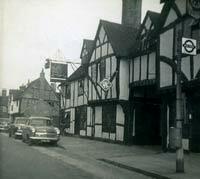 Outside The King's Arms in Amersham. 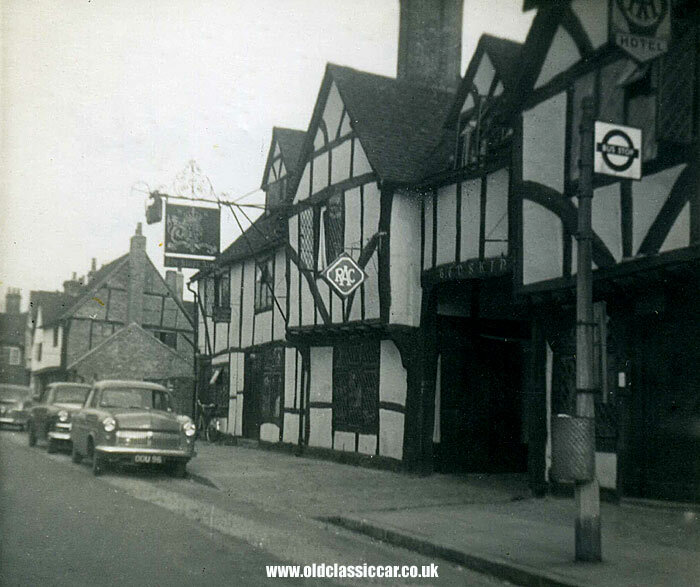 OGU 96 was a 1953-registered Mk1 Consul, and is shown here - along with an E-Series Vauxhall - parked outside The King's Arms Hotel which, after a little research, has been confirmed as a hotel situated on the High Street in Amersham. 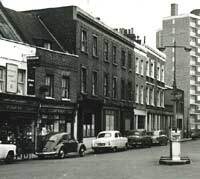 Photos of this establishment today differ little from this 1950's view, although the RAC and AA Hotel signs have long since disappeared, and the roads are disfigured with yellow lines and white cross-hatching. The old bus stop sign has also vanished. 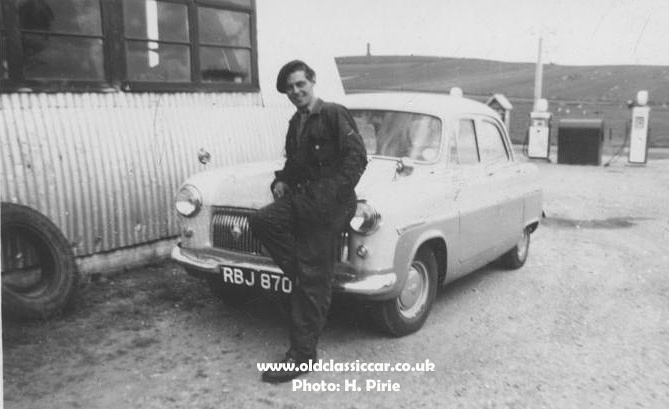 Henry worked at Dinneswood Garage during the 1950s, and has sent over a number of motoring photographs that relate to his time there. 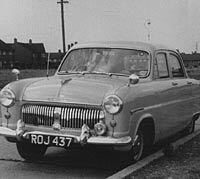 Included are the following pair, of a Suffolk-registered 1954 Consul (RBJ 870) that, at the time, had recently been added to the garage's self-drive fleet. Shiny and ready for action, it is shown shortly after receiving a fresh coat of paint in a two-tone colour scheme. The photo dates to 1959 or thereabouts. In addition to the fine Ford, a selection of petrol pumps and the corrugated tin garage building itself are also in shot, as of course is Henry himself. Henry also features in the second photograph of the Ford. 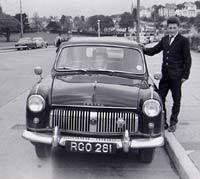 This in fact could have been taken before the above image, as the car has an AA badge fitted to its grille in photo 1, but not in number 2. Thanks for emailing them over. 8. Another example of the convertible version, in LHD. My thanks to Leo for sending over this interesting photo, and allowing it to be published on OCC. 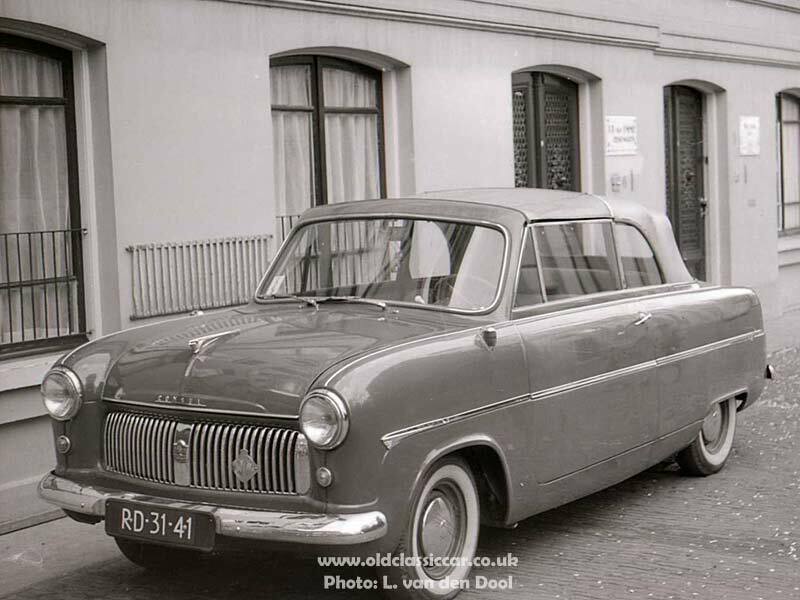 As with the first image on this page, it shows a Mk1 Consul Convertible a long way from where it was built, in this case Utrecht, in 1958. Unlike the previous car though, this is a LHD (Left Hand Drive) example. Just a few years old at the time, the smart Ford was yet to display the corrosion that many cars of the 1950s and 1960s would go on to exhibit, sometimes after just a few years of use. The paintwork, chrome and windows all glisten on this example, so maybe it fared better than many. Note the extra lamps, fitted to both front wings. 9. A RHD Mk1 Consul Convertible. The following two photos were posted to Facebook by Gregory Jackson in 2015, and with his permission I'm sharing them here also. 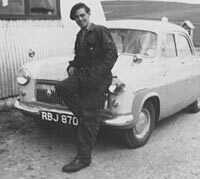 Both feature a Mk1 Consul Convertible, registration RGO 281. A quick check of the GO registration series page on OCC confirms that this London issue, was introduced in April 1955. First of the photos is a head-on view of the classic Ford. The second snapshot sees the car parked, on a hot sunny day, with its roof folded down. Chunky rear tyres offer the car a better chance of negotiating a muddy road or field. Apart from the fitment of Town & Country tyres, it appears to be in standard condition, although I'm sure it began life fitted with a passenger door handle, which is missing at the time of this photo. Thanks for the pictures Gregory. 10. 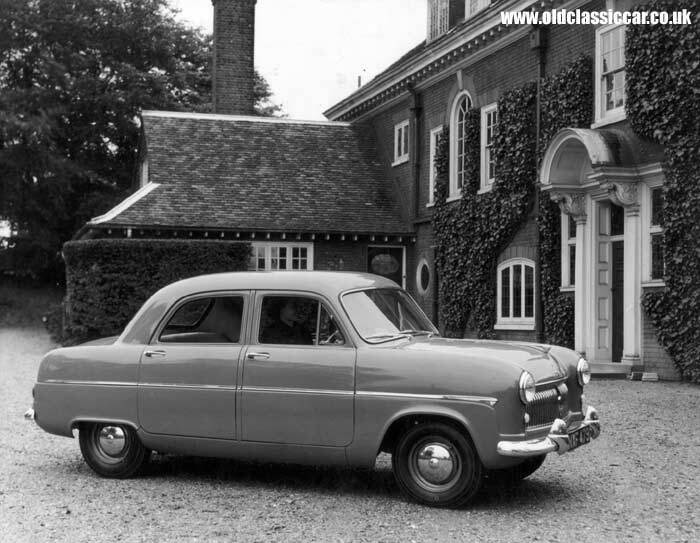 A 1955 Mk1 saloon. 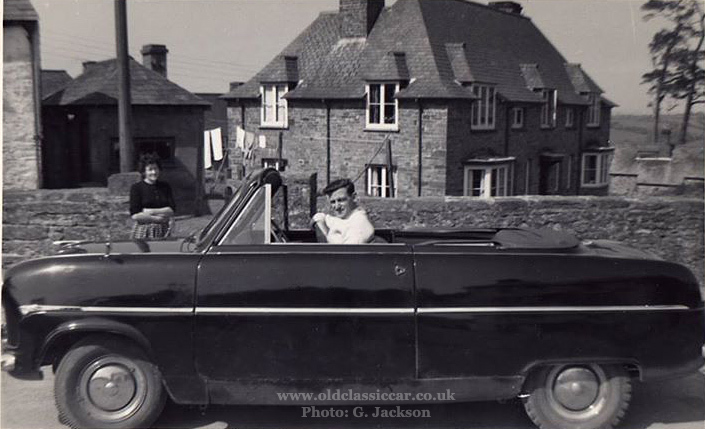 As with the photos of a convertible Mk1 shown above, the next snapshot - of a 1955 Mk1 Consul - popped up on a Facebook page, and is shared here too with the owner's permission - thanks Keith. 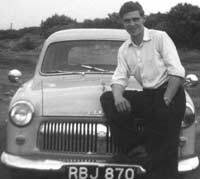 The Ford belonged to his father, and was registered ROJ 437 (a registration issued in the Birmingham area). The company that produced the chrome AA member's badges, on a yellow background, must have done a roaring trade as they can be seen fitted to so many cars during this era, the 1950s. They're far more prevalent than those for the RAC. Twin wing mirrors, a small spotlamp, and a wing-mounted aerial that point to a radio being fitted, are options installed onto this example. 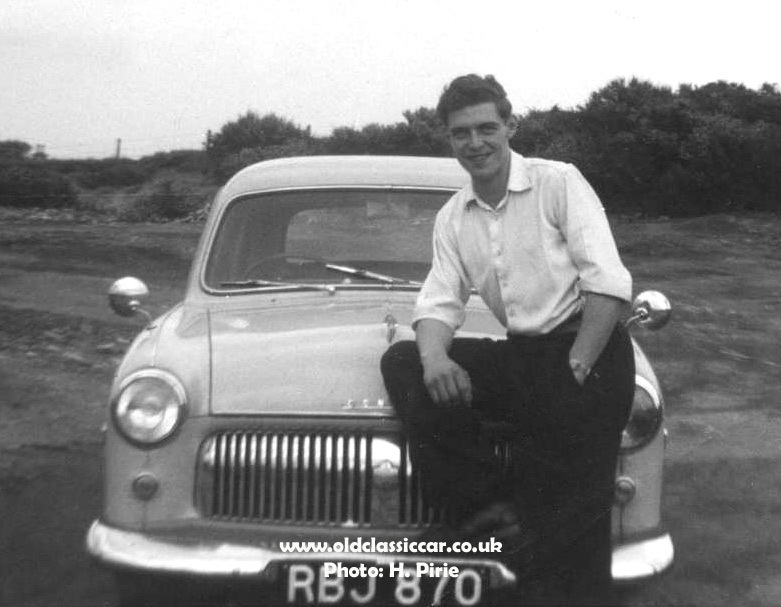 A further selection of photos showing more Mk1 Ford Consuls can be found here. Click here for more motoring related photos.